When did a holiday all about showing your love for another person, become a holiday to showcase how much you can spend? Valentine’s Day used to consist of buying a heart-shaped box of chocolates and maybe flowers, if you were really going all out. Now, however, it’s become a day of extravagant gifts, dinners, and possibly trips. Unfortunately, in this switch of norms, many couples are left feeling stressed and overwhelmed over planning the perfect day. And in the end, the true meaning behind the day tends to fall to the wayside. You don’t have to spend a fortune to show how much you care and appreciate your significant other, and often times, it’s the gifts that are inexpensive, or even free, that can mean the most. Instead of running out and spending a fortune, consider trying one of these ten ways to celebrate Valentine’s Day on a budget. Whether you opt to make breakfast to treat your loved one in bed or work together to make a meal, getting in the kitchen and making a home-cooked meal can be a great way to treat your sweetie to a Valentine’s Day on a budget. Ingredients, depending on what you make of course, will likely cost less than if you go out to dinner and the thought will be much appreciated. Another great option would be to take a cooking class, not only do you get to spend some quality time together, but you get to learn a new skill as well. While our culture might tell you that diamonds or expensive watches are the way to go when it comes to gifts, it’s often times the creative, thoughtful, and usually free, gifts that mean the most. Fill a mason jar with chocolates and small notes of all the things you love about your significant other. Also, don’t underestimate the effect of a handwritten love letter or poem. Since it’s so rare that people handwrite things or take the time to actually write their feelings down, this gift could be more of a hit than you’d think. Whatever you chose to do, don’t worry about spending a fortune, instead get thoughtful. Although this particular activity might depend on your location, as I’m sure this is much too cold in some places, there’s nothing quite as romantic as looking up at a starry, night sky. Lay out a blanket and grab a bottle of wine and merely take the time to appreciate our beautiful galaxy. It’s the perfect time to cuddle and chat. If you really get into it, you can even download a sky watching app to learn exactly what you’re looking at. Since February tends to be cold in various parts of the country, an indoor picnic can be a perfect activity. Set up a blanket and lay out all the food in your living room. This is still a romantic and fun gesture, but having it indoors will keep you much warmer and keep the outdoors away from your food. If you’re dead set on going out to eat, you can still swing that option if you look around. Apps like Groupon or sites like restaurant.com have tons of great coupons for some of your favorite restaurants. That way you can still have a romantic meal all while staying on budget. Nothing says romance like a crackling fire and in the dead of winter, nothing feels cozier either. Plan your Valentine’s indoors by an open fire or outside by a fire pit. Lay out a blanket, pop some champagne and roast some s’mores or sit by the fire and enjoy some delicious fondue. After all, chocolate covered strawberries are kind of a must on Valentine’s Day. Playing games can be a great way to spend some quality time with your Valentine. Grab a board game like Scrabble or even opt for a video game you both enjoy. If games aren’t your favorite, a relaxing evening with a puzzle can be another great option and are available for cheap! Valentine’s Day is all about remembering your significant other, so why not take a walk down memory lane? Gather together photos of the two of you, vacation reminders, movie tickets, a matchbook from the restaurant you had your first date in, or even dried flowers you might have purchased or been given. Put them all together in a decorated box or shadowbox. This serves as a beautiful and thoughtful reminder of all the things you’ve enjoyed together, while being on budget since it’s made up of items you already have. Instead of spending a lot at the movies, create your own movie night right inside your home. Rent a DVD or grab one of your favorites from your own collection and put it on inside your living room. Of course, since it’s Valentine’s Day, you might want to jazz it up a little. Lay out some yummy snacks and have a nice bottle of wine, maybe even opt to light some candles to create a more romantic mood. If you both have a vacation day to use up, take the day off and spend the day together. It’ll be like a staycation. Relax and lounge at home just enjoying each other’s company, become tourists in your own town and go around to all your favorite spots, or take the time to go on a bike ride together or go ice skating. Whatever you chose to do, it’ll be romantic and fun because you’re together and have the day off. You don’t have to show your love through luxurious gifts and getaways on Valentine’s Day. Instead, get creative and thoughtful to show how much you care. Not only will you still have a fabulous day, but you might find that those gestures can mean so much more. 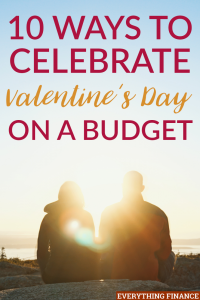 What are some ways you’ve celebrated Valentine’s Day on a budget?